Venetians love to colour pastas and risottos jet black using squid or cuttlefish ink. The piles of squid in the Campo Pescaria market are testament to this, sold with their ink sacs still inside, little rivers of black staining the crushed ice beneath. The ink can also stain your lips as you eat, giving you a temporarily ghoulish air, but then, in the spooky days of mid-winter, a spooky kind of dish seems just thing. If you’d like to serve this recipe in bite-size, some flat-bottomed spoons (the sort that you can buy at Asian supermarkets) make for a nice presentation. 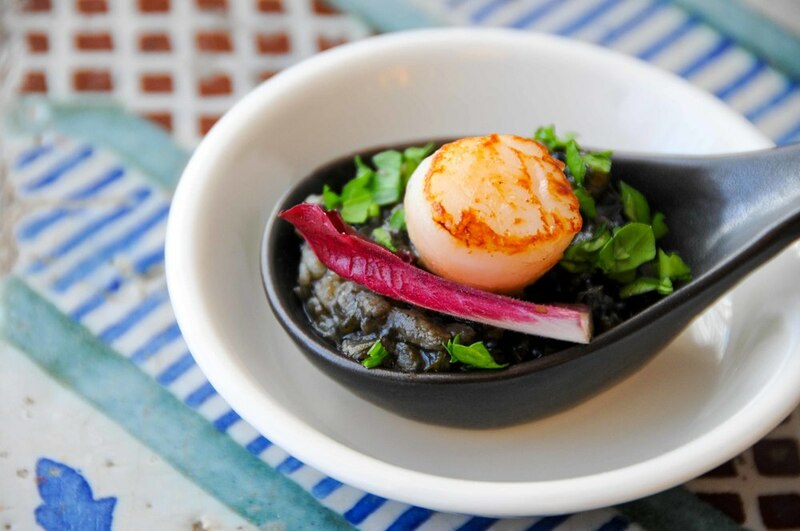 Otherwise, with three scallops floating aboard little gondole of radicchio on top, it makes a striking starter. In a large pot, heat the oil olive over medium heat – add the onion and celery and fry gently until the onion is translucent. Now add the crushed garlic, and bay leaves, and cook for a further two minutes. After this time, turn the heat up to high and add the rings of squid as well as the coral trimmed from the scallops. When the squid flesh has turned from translucent to white, slosh in the white wine, shortly followed by the chopped fresh tomatoes. Now add the water, and cuttlefish ink. Allow to reach a boil before turning the heat down to its lowest setting and seasoning with salt and pepper. Cook at a simmer for 1.5 hours. After this time, strain through a sieve, returning the strained stock to the pot and placing over a low heat. To make the risotto, heat 40g of the butter along with 3 tablespoons of olive oil in a wide heavy-bottomed pan, (the reserved 20g of will be added later). Fry the onion gently until translucent. When the onion is cooked add the Arborio rice, and stir to coat. Fry for 1 minute, then add the white wine, stirring vigourously as the rice absorbs the wine. Once all the wine has been absorbed, begin to add the squid stock, one ladle-full at a time. As you cook, stir the risotto gently with a wooden spoon. Unlike most risotto recipes, we can’t add cheese or crème fraiche at the end as it would turn the risotto grey-ish and clash with the clean, briny flavour. We are relying therefore, on stirring alone to coax the gluten from the rice grains and create a lovely silken texture. After about 25 minutes of stirring and ladle-ing, you should have gotten through most of the stock. Do a quick taste-test to ascertain if it needs further cooking or seasoning. If the grains are still on the hard side, add more stock and continue to stir until this has absorbed. Add salt and pepper to taste. When the risotto is cooked to perfection, add the 10g of cuttlefish ink, as well as the chopped parsley, and final 20g of butter. The risotto should be dark and glossy-looking by now, but if not, top up the colour using a little more ink. Stir in the juice of half a lemon to finish. Meanwhile, to cook the scallops, heat a little olive oil in a non-stick frying pan over high heat. When the pan has reached temperature, carefully introduce the scallops, allowing to sear for at least one minute on the first side, before gently turning to cook the other side. To serve, arrange the scallops upon the radicchio tips and place atop a portion of the risotto before scattering with chopped parsley. Or, using a teaspoon, divide the risotto up onto the flat-bottomed spoons, top each with a single scallop, and a place a little tip of radicchio along with a few flecks of green parsley.